The L.A. Dodgers will air a series of radio broadcasts aimed at women, particularly those who don't know much about baseball. 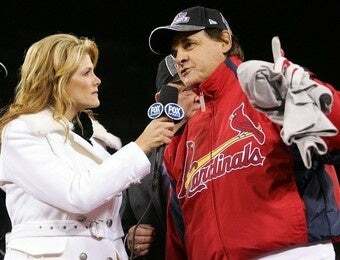 Jeanne Zelasko will do play-by-play and talk real slow so that these dames can get the infield fly rule through their thick skulls. The broadcasts will only be heard on the internet, because that's really the only place women are allowed to follow baseball and Zelasko will be joined by Dodgers assistant coach Mark Sweeney as the color analyst. She says the goal is to be "instructive" more than "entertaining." "I like to look at our broadcast as we're not afraid to explain something most people might take for granted," Zelasko said. One specific example occurred during a recent run through when Sweeney made references to the six hole, Zelasko said. "I know what that is in the lineup, but I said to him, `Mark, tell people what you mean.' It's the sixth spot in the lineup," Zelasko told City News Service. I pray that just one time when Sweeney tries to offer a point of clarification, that the listeners in internet radioland get to hear the back of Zelasko's hand slapping against the side of his head followed by her screaming, "Pipe down, you! The girls are talking." Oh, and a lot of swearing would be good too.